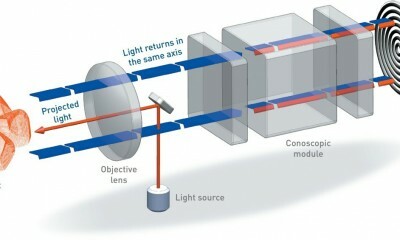 Optimet laser sensors are co-linear, meaning the laser exits and returns from the sensor on the same optical axis. 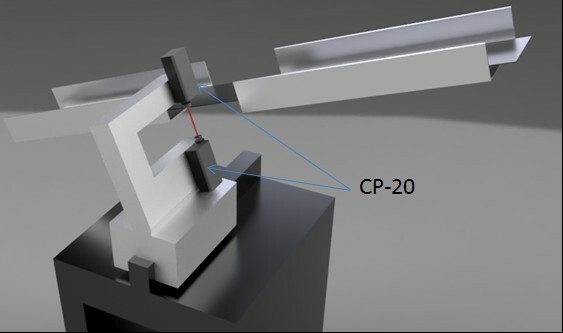 This allows the use of two sensors which can be aligned to each other perpendicularly to a surface to perform a thickness measurement, as shown below. 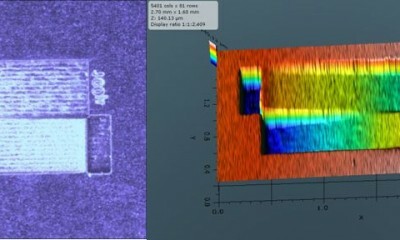 One sensor can be set above the sample, while the other one exactly below. 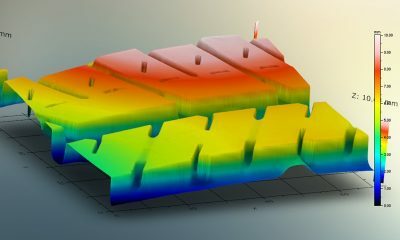 After the two sensors have been aligned, thickness measurement is straight forward and simple. Each sensor provides the absolute distance to the sample, and can be the reference measurement of the other sensor. Now, by using this formula we can extract the sample thickness. When measuring thickness of diffusive material, no cross-talk exits like for transparent materials. Any of Optimet’s diffusive sensors can perform the measurement including the CP-3, CP-10 and CP-20, used for fastest measurement rate.